The retrofit of the existing Noosa Sebel water feature required a unique client brief that asked for the feature to be built in a modular/prefabricated format, dropped over the existing structure and installed with minimal time spent on site. The feature had to remain safe and sturdy due to its prominence in a public space. After an initial concept had been discussed with the client, an onsite meeting and site measurement was undertaken. The details and measurements taken were then inputted into our 3d Cad software where the water feature concept was built and developed in 3d, ensuring it met the shape and profile of the existing feature. Detailed assembly and working drawings were a major part of the manufacturing process for this project. They ensured that the 3 intersecting modular components of the water feature could be assembled and fabricated to the required dimensions and checked in our factory before being packaged for delivery. 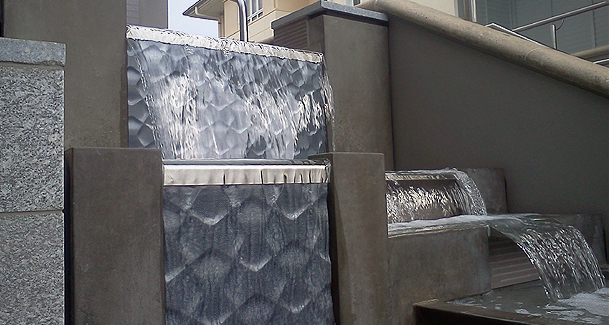 To eliminate time on site the majority of the water feature components are finished in our factory. Works to the existing structure are completed then they are simply dropped into position. Remaining elements such as tiles and spillways are then attached to the water feature and levels checked to ensure even water distribution. 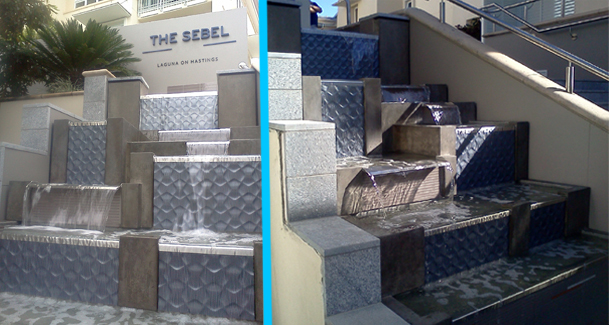 The Sebel Resort Noosa is a testament to H2O Designs manufacturing method of prefabricating water features offsite. Without the budget to completely remove the existing feature the 3 part modular water feature was developed as a refurbishment to update the existing structure. The feature is a combination of tiled water walls, cascading spillways and shallow troughs. It is designed to work in conjunction with the existing ponds and pump systems. Its polished concrete finish is contemporary which works in harmony with the Urban surroundings.